Preparing for a visit to Orlando can turn into a full-time job, and paying for it can devour a small fortune. Most books on the market make the problem worse, either burying vacationers in tiny details and anxieties or functioning as unquestioning cheerleaders for the high-priced theme parks and resorts. 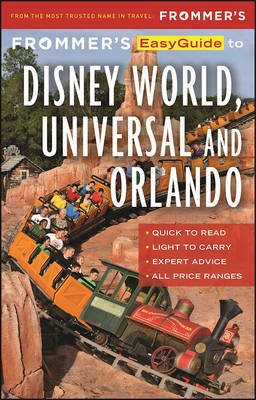 But Frommer's' 2017 Easy Guide cuts through the noise and hyperbole to deliver what no other book does: Honest talk, frank advice, and an affectionate insider's secrets to appreciating and affording Walt Disney World, Universal Orlando Resort, Sea World, and the inimitable attractions of Orlando and Central Florida. Praised by locals and visitors alike, it's the only guide to show you Orlando the way you actually want to see it. No other guide book is as comprehensive while remaining so concise and so honest. No other book synthesizes advice, history, and good sense in such an easy-to-read format. This Orlando guide is so novel and groundbreaking that its author, Jason Cochran, was awarded Guide Book of the Year from the Society of American Travel Writers for creating it. Cochran, who is also the editor-in-chief of our popular website, Frommers.com and the co-host of the Frommer Travel Show, keeps you on top of the newest developments in this ever-shifting tourist scene. - Rankings of the area's best resorts and well-priced hotels - Smart appraisals of what's worth waiting in line for - and what you can skip - Reviews of non-chain restaurants - a full chapter's worth - so you can find the best flavors beyond the usual franchises - Money-saving tips and hacks to tame the high cost of an Orlando holiday - Tips on navigating the complex theme park systems that aren't down with unnecessarily obsessive details-Learn what you need to know and then relax. The book is in the lightweight and easily-carried format of our Easy Guides, and it also contains a valuable fold-out map.